This option provides all details of leaves that the logged-in user has applied. Requesting or removing or changing leaves can be done through this window. Users can use toolbar to change the view to see all leaves or leave of a particular year. Step 1: Click on -> Click on button on to open “Add Leave” window. Step 2: Set < From > date by clicking on calendar icon at the end of field. Step 3: Set < To > date by clicking calendar icon at the end of the field. And this is optional, this feature is use to request leaves as range. It will take same date in < From> field as default. 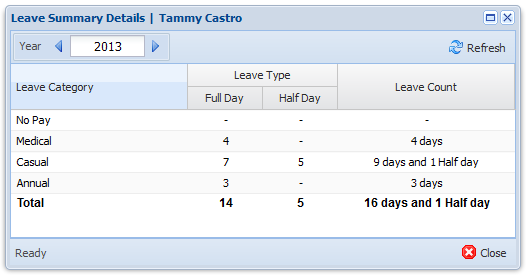 Step 4: Select < Type > of leave as “Full Day” OR “Half Day”. Step 5: Type the reason for requesting leave(s) at the < Reason > field. Step 6: Click on button to save the leave(s) request OR Click on button to exit. After requesting leave(s), it will appear as pending until it gets approved. Users cannot request leaves for past days. Can request only for current date and future dates only. This view is use to view leave that requested and status of the leave. It provide user to sort data according to the column title by clicking on the column header. Step 1: Click on -> Click on drop-down arrow of option. Step 2: Select view option either as < Year > or < All >. Default view option is < Year >. For < Year > view, there are two navigation keys to help the user. By clicking on left arrow key, user can view leaves of previous years, and right arrow key changes the view to leaves of next year’s according to the year mentioned between navigation key. To change applied leaves that are in “Pending” sate. Users cannot change/ edit leaves that are approved or rejected. Step 1: Click on -> Click on “Edit” icon of the action column that you need to change/ edit. Step 2: Do the necessary modifications in the “Change Leave” window. Step 3: Click on button to save the changes OR click on button to exit. This option is to remove pending and upcoming requested leaves. Users cannot delete backdated, approved or rejected leaves. Step 1: Click on -> Click on “Remove” icon of the action column that you need to remove. Step 2: Click on “Yes” button on “Remove Confirmation” pop-up window to confirm the deletion. 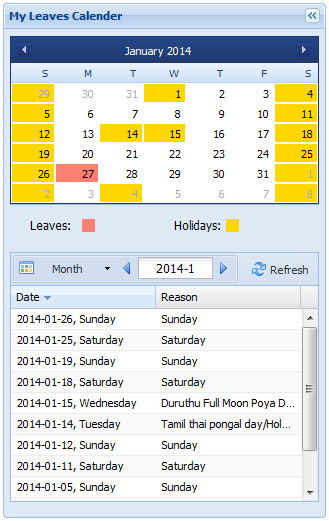 You can use left side calendar panel to see holidays of logged-in user’s country. Additionally the calendar of this panel view the dates that user may have applied in red color. All holidays are marked in yellow color. This option facilitates to view the summary (total count) of leave taken by user in a particular calendar year. Go to -> Click on option in “Leaves” window to open “Leave Summary Details” screen. This display the total leaves taken by the user based on leave category. Users can change the calendar year through left and right navigation keys of option.